Ombar don’t believe you should have to compromise on taste to make healthy chocolate. That’s why they have worked hard to deliver the smooth deliciousness associated with traditional premium chocolate by creating a range of award-winning raw chocolate bars that are as healthy as they are delicious! 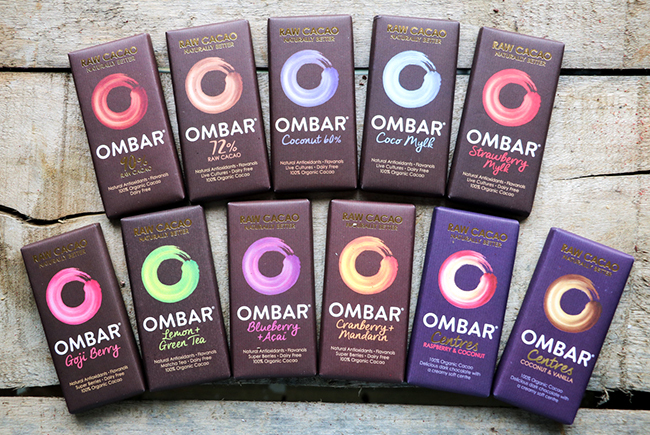 Ombar’s chocolate is not only sourced from the best of the Ecuadorian cocoa farms, it is also raw. They like to keep it that way, so their methods ensure that they preserve as much of nature’s original goodness as possible – hence why their bars have six times more flavanols than comparable chocolate brands. They treat their chocolate like a health food – because it is – and therefore only use the healthiest ingredients such as unrefined coconut sugar, real fruit and live cultures. What flavours are in their range? For more information, please visit www.ombar.co.uk. You can also find them on Facebook, Twitter and Instagram. To be in with a chance of winning, simply sign up to our newsletter using the form above. By entering your details, you will automatically be added to the Free-From Heaven email newsletter mailing lists, keeping you informed of news, special offers and promotions via email. Anthem Publishing will not pass on customer email addresses to other companies. You may unsubscribe from these messages at any time. The editor’s decision is final. The competition is open to UK residents only. Closing date: 19 December 2016.